People find laws easier to follow when they understand the point, or value, of them. After surveying drivers about roadside worker safety as part of the annual Cone Zone campaign, which runs May to August, we were reminded how important this is to keep in mind. Worksites on or beside a road, cordoned off by cones. “Mobile worksites” around vehicles stopped on the roadside with red, blue or amber flashing lights. The laws are fairly simple, and revolve around slowing down and respecting traffic control (first worksite), or slowing down and moving over (second worksite). But the survey uncovered some misconceptions that we think could be leading drivers to believe they shouldn’t have to adjust their driving near roadside workers. Let’s take a look at four such mistaken beliefs. This misconception suggests roadside workers aren’t at risk, so why bother slowing down? Fact is, between 2006 and 2015, 14 roadside workers were killed in BC and another 226 were injured, having to miss work, after being hit by motor vehicles on the job. There is a problem. They can do all the right things, but they can’t truly be safe without drivers contributing with their own safe actions. Roadside worker safety is a two-way street (even when traffic is single lane alternating!). No one is more responsible than the other – it’s everyone’s responsibility. I shouldn’t need to slow down if there are no roadside workers on site. First off, how do you know for sure there are no workers on site? And, even if the site is clear of people, constructions zones can pose other challenges calling for reduced speed and increased attention: changing traffic patterns, loose gravel, narrower lanes, bumps, uneven pavement and reduced visibility, to name a few. Construction zone speed limits are there not only to protect roadside workers, but also drivers. Roadside work should be done at off-peak hours – I shouldn’t have to deal with delays. We try to reduce traffic delays by avoiding roadwork during peak periods, when possible. Unfortunately, there’s just no way around it sometimes. Take an ongoing, large excavation needed for a project, for example. There are times when an around-the-clock lane closure is needed because the magnitude of the work doesn’t allow for opening all lanes until that particular work is fully completed. Then there’s emergency works that need to happen immediately, or equipment breakdowns that push work into rush hour periods. If you face roadwork during rush hour, it’s probably for a reason. It takes the right mindset to protect roadside workers. It takes respect for the law, but even more so, it takes respect for the men and women whose lives depend on drivers seeing the value in their safety. Has this changed or confirmed your perspective? Let us know. 4 Responses to Roadside Worker Safety: How Do You Look at It? about stationary site. when the lct setup construction sign & prepare sign & tcp sign, which one is counting into stationary site start? amber light: Red, yellow, blue.. which light is the first prior to others on the road? 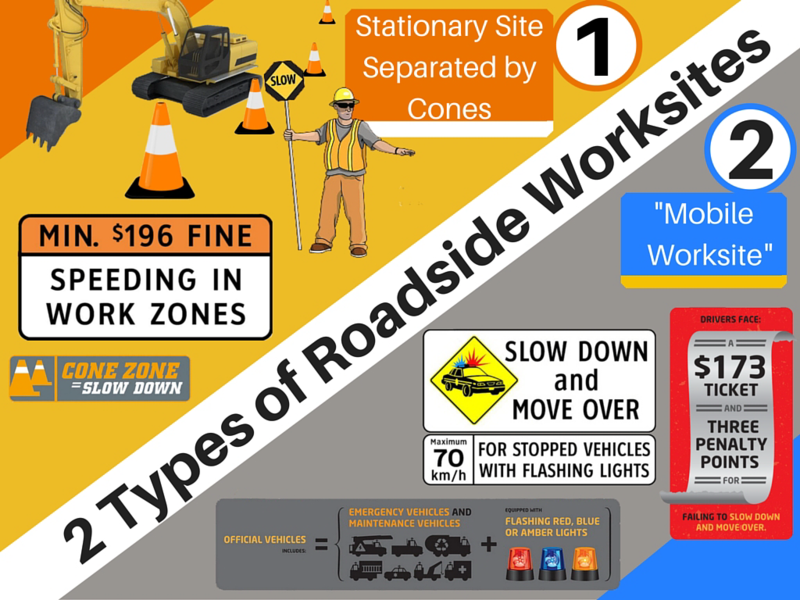 Typically, we warn drivers of upcoming work zone with construction ahead sign, which may be followed by construction speed zone signage. Sorry, I’m unsure what you mean by your red, yellow, blue light question. Some vehicles have yellow, others have red, blue, etc. All of these are treated the same when it comes to the slow down move over law. I travel Van-Calgary a lot. Part of the problem is not the stoppages, but the management of the traffic at them. Frequently, and this happens mostly at L-O-N-G stoppages, one side will get to go for what seems like forever…..and then the other one – but not for nearly as long. Too often this occurs when the highway is busy in *both* directions. Movement should be changed from side to side every 10 minutes – not left to the whim of the flaggers. Doing so would allow everyone to see progress, even if it is not super-speedy. Reduction in frustration would be a good thing – then everyone drives away at a safe speed, too. I can foresee maintenance on the 2 lane sections of the Trans-Canada having to be done at night. It is already impractical to single lane during the day in July and August and the way the traffic is this year it is going to be difficult to do so in June and September (today it was taking over 15 minutes to clear lines). Unless something kills traffic growth stone dead this will certainly happen well before all the 2 lane sections are upgraded. Trouble is the highway is pretty busy at night too as many truckers avoid this section during the daytime traffic. If it does happen I don’t envy the flaggers who will be playing russian roulette in the dark with half-asleep drivers. There are plenty of spots where it is more than dangerous enough during the day. I certainly won’t be doing it – I will quit first.